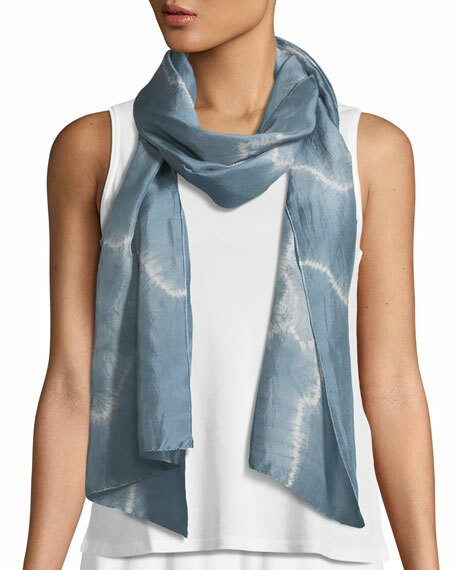 Eileen Fisher "Archipelago" scarf in shibori silk. For in-store inquiries, use sku #2531980. Eileen Fisher long, melange-knit cardigan. V neckline; one-button closure. Long sleeves. Patch pockets. Relaxed silhouette. Duster length. High-low hem. Organic linen. Hand wash. Imported. Smooth stretch jersey tank by Eileen Fisher; available in your choice of color. Approx. length: 21"L down center front; 27"L down back. Scoop neckline. Sleeveless; full-shoulder coverage. Fitted silhouette layers smoothly. Silk; dry clean or hand wash. Imported. Necklace not included. Eileen Fisher fine crepe cardigan in an organic linen-blend. Open front. Three-quarter sleeves. Relaxed silhouette. Hem hits below the knee. Eileen Fisher fine crepe cardigan in an organic linen-blend. Open front. Three-quarter sleeves. Relaxed silhouette. Hem hits below the knee. Straight hem. Organic linen/nylon. Hand wash. Imported. Eileen Fisher missy maxi cardigan. V neckline; button closure. Long sleeves. Patch pockets. Relaxed silhouette. Duster length. High-low hem. Organic linen. Hand wash. Imported.